SKU: GD-IM26-IRY3. Categories: Adrenal Support, Athletic Boost, Brain Support, Energy Boost, Extracts, Immune Support, Longevity, Men's Health, Mood, Stress Relief, Women's Health. Tags: ADD, ADHD, Adrenal Fatigue, Alzheimer’s Disease, Anxiety, Asperger's, Autism, brain damage, Brain Fog, brain trauma, Cognitive Decline, cognitive function, concentration, concussion, depression, distractedness, focus, forgetfulness, head trauma, high stress, lions mane, low mental energy, memory, mental energy, neuro-protection, neuro-regeneration, Neurological disorders, neuroprotection, neuroregeneration, Parkinson’s Disease, Poor Memory, sludgy thinking, sluggish thinking, Stress Burnout, stroke. Of all the wonderful fungi being studied for beneficial health effects, three have continually risen to the top, both regarding their supporting research and long-standing traditional uses. While not a mushroom, we’ve also added extract of a fascinating Japanese botanical, Huperzia serrata, to our mix for supplementing these fantastic brain boosting fungi. Known by its English name toothed clubmoss, this unique plant is a useful remedy in Traditional Chinese Medicine (TCM) and native to many parts of Asia. Another non-fungus, Bacopa monnieri goes by the English name waterhyssop, though it is more widely recognized as simply “bacopa” in the health world. In times long past and into modern times too, bacopa remains a strong healing remedy in Ayurvedic teachings and practice. Memory & Cognitive Support No Matter How You Mix It! I really enjoy this purchase. The tea tastes mild and pleasant – which is surprising because of its intense color. I do feel calmer in general and my thinking fluidity is better. My lucid dreaming is off the charts. I am very pleased with the product at this time. Will give more details later. The product was better to relax for bed than taking it before work. If u take it with caffeine you get better results.. anybody else feel the same way? I add this to my coffee along with MCT oil and it gives me a great energy boost in the morning. I also feel energized when I take it alone in some warm water. Not sure if it’s improving my memory yet but I like how it makes me feel happy and alert without anxiety. All of our mushroom formulas are from the mature fruiting bodies and a Dual Extraction Process: both water and alcohol extraction. This combination allows for the extraction of some of the most active and bioavailable compounds. In the extraction process, we use purified water and Non-GMO ethanol. NEURO SHROOM’S PRINCIPAL EFFECT, NEUROPROTECTION: WHAT IS IT? Underlying all the frill and fantastic feats our formula lists above, everything Neuro Shroom could possibly be capable of comes down to two powerful traits in its ingredients: neuroprotection and neuroregeneration. But what are these and what do they really do? 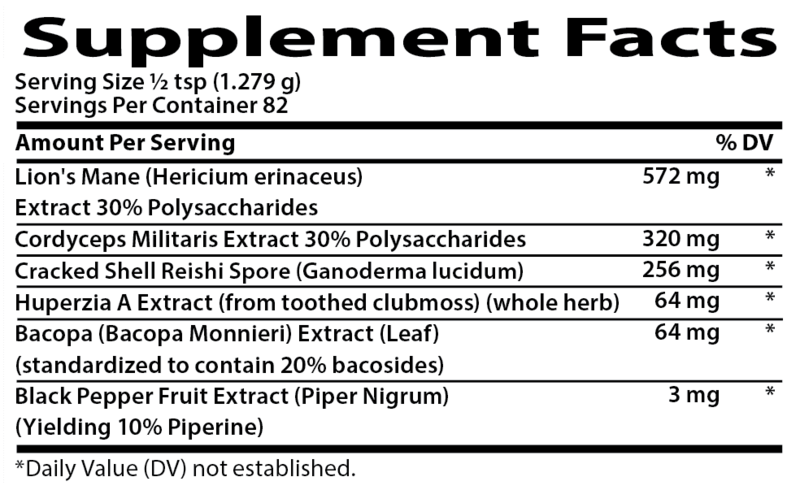 To put it simply, all of Neuro Shroom’s star-studded ingredients contain some very powerful and unique antioxidants. What’s more, research and studies have shown that these antioxidants—more noticeably and remarkably compared to the antioxidants we’re used to hearing about, such as from green tea, dark berries, and dark leafy greens—specifically target the nervous system. In short, the antioxidants in our herbal and fungal ingredients are better at targeting inflammation and oxidative damage in the brain, nerves, and neurons than any other food or supplement. The result of these antioxidant actions? Neuroprotection. Even better? 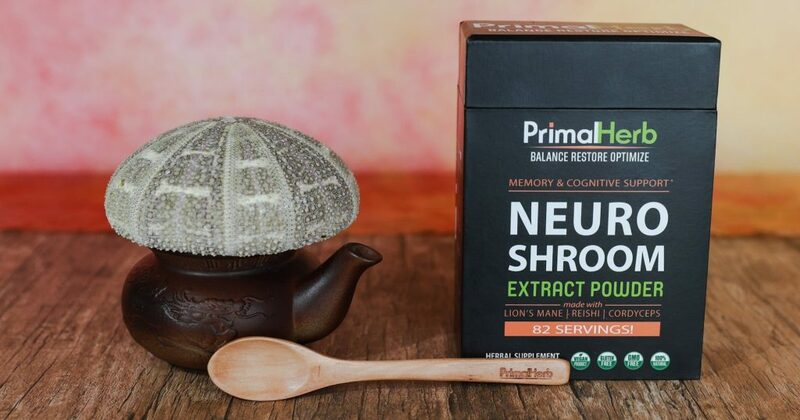 Neuro Shroom’s antioxidant ingredients don’t just have the potential to protect the nerves. Though this sounds like a very basic feat, what this means for the rest of the body and brain is quite exciting. Protection and healing of the nerves and nervous system means at the very least one main benefit: the brain works better, faster, and stronger. This means better cognition, better ability to focus, less distracted tendencies, less brain fog, and also the improved ability to multi-task and tackle many different goals, projects, and to-do lists at the same time. Stronger, less-frayed, repaired, and nourished nerves apparently mean better energy, especially in the mental faculties. Who would have thought? Many of us have faced physical fatigue, though mental fatigue is a whole different animal. It can be hard to figure out how to fix it (or know how to fix it or where the problem even comes from), though studies show that nerve damage and inflammation can be one of the leading causes of issues like chronic fatigue or brain fog. Thankfully, nerve-targeted antioxidants can protect this, thereby restoring energy. Another perk of a fortified, renewed, and protected nervous system: improvements in mood and the ability to deal with mental stress. That’s right: healing the nerves has a surprising way of smoothing over symptoms of stress, which all too often also branches out into the territory of causing mental fatigue and focus problems. But these functions can also help us deal with stress better. 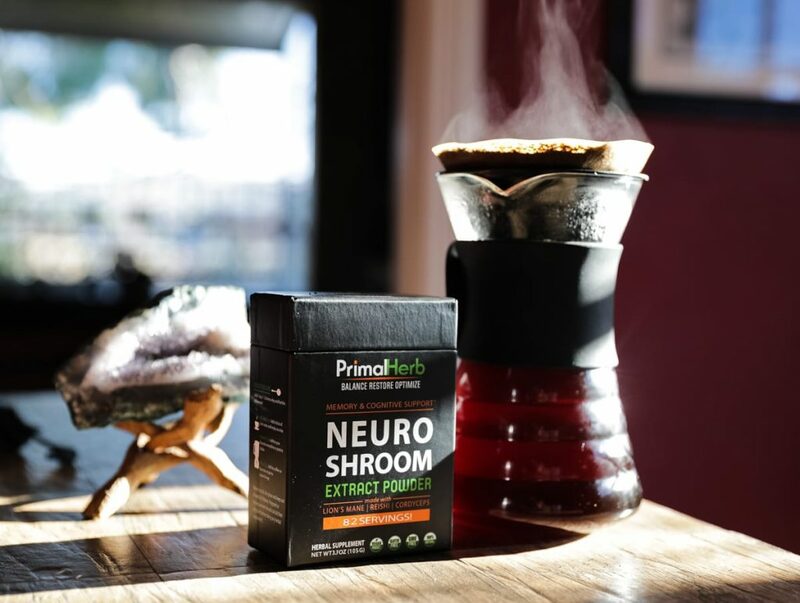 By extension, people struggling with anxiety and depression can look to Neuro Shroom’s ingredients as a helpful tonic, making life less of an emotional and stressful roller coaster ride. People experiencing struggles and disorders of the mind and nervous system could also possibly experience a boost and improvement to the quality of life and wellbeing with the help of neuro-regenerative antioxidants. Though research shows no herb or mushroom can completely heal or cure any of these such issues, providing a nourishing, antioxidant, neuroprotective and neuroregenerative tonic for the nervous system may just be the next best thing. 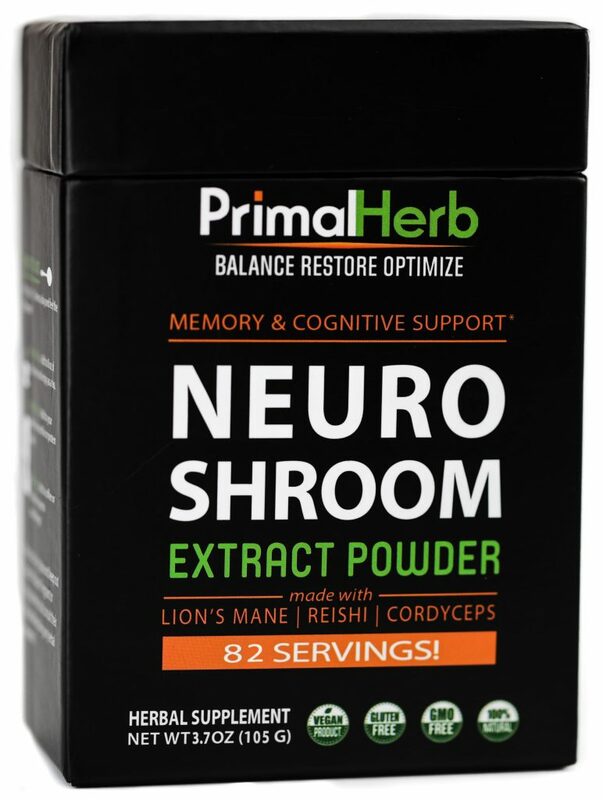 Neuro Shroom can be taken day or night – with or without food, so enjoy! I don’t take the time to review a product unless it has really made a noticeable difference in my daily life. This product is worth spreading the word of, it works and works well. I mix it in my coffee every morning and it gives me a calm and relaxed feel while still giving me the ability to have a razor sharp focus. People say it “lifts the morning fog” and that’s how I would describe it as well. Your money will not go to waste with this product, can’t wait to try their other blends! It gently facilitates my focus with out rushing me to do it. It does not leave me hanging either. I can use the half teaspoon daily without any taste problems,no aftertaste. For me it reminds me of what instant tea used to taste like in the 80’s. I’m satisfied with the reason I purchased it. On time and great product!